Last weekend, my family left for a few days over spring break, and I was able to get a couple solid days to duct and complete the install of an ERV that I did some prep work for back in August. I needed to have the attic ceiling spray foamed so everything was in conditioned space. I had a RenewAire EV90 to put in, and wanted to feed it down from an attic. Normally you would not want to put ducts in an attic if you care about energy or indoor air quality, but I had previously had the underside of my roof deck spray foam insulated, so the volume of the attic was all inside conditioned space (inside the envelope). In order to serve just the bedrooms, I wanted the ERV system ductwork to be completely separarte from the regular heating and air conditioning ductwork. First, my need for fresh is independant from my need for heating or cooling. Second, the airflows needed for ventilation are much lower and I wanted to ensure that fresh air was delivered where I needed it. So I decided I would separately duct this ERV system from the home’s forced air system. Dettson's SmartDuct was a perfect distribution system as they are easy to retrofit, especially in the low 4:12 roof pitch of my attic, which severely limited head room to work in if I wanted the air outlets somewhat in the center of the room. Additionally, the SmartDuct diffusers are capable of ~30 CFM per run. With three bedrooms and a living room area on my top floor that would be fed by the ERV, that meant 4 supply vents (take the 90 cfm capacity of the EV90 divided by 4, or roughly ~22 CFM per vent). For the exhaust side of the system, I ran a big 6” flex duct to a central return at the top of my stairwell terminating in a 10x6 boot. I located this here to help pull from other areas of my split level home and the stairwell is the central stack. Off this exhaust branch, I also tapped off a small Dettson duct into the upstairs bathroom for continuous exhaust to supplement the existing bath exhaust fan. Coming off the ERV on the supply side, a short elbow connected to the 6” round duct that effectively became the trunk/plenum about 20 feet long, and the SmartDuct 6” saddles were tapped off those. The other end threaded into their black diffuser, fed through a 4” hole in the ceiling. I was meticulous about duct sealing using foil faced tape (mastic in the tight quarters was not feasible). Once the connections were made, the system turned out very tight. In fact, the SmartDuct was too tight as the air flow coming into the bedrooms was noticeably breezy and too powerful on my face when lying in bed. So I made intentional holes in the attic near each end of the pressured plenum to create intentional leakage into the attic. 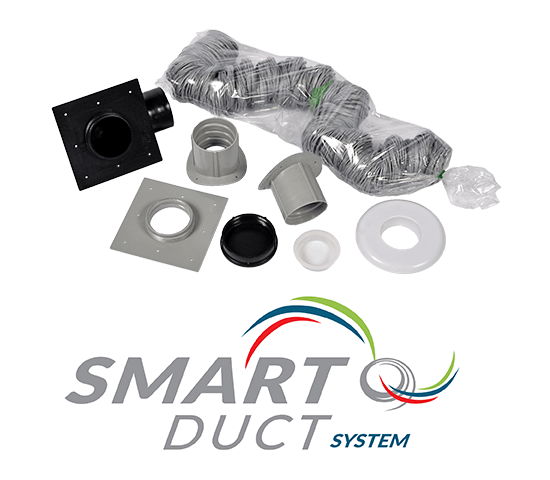 Dettson SmartDuct ductwork makes a great and easy way to have a ducted ERV system separate from the main furnace system, with a relatively easy installation. It took me most of the day Saturday and a couple hours Sunday to do the entire job by myself. For easy filter maintenance, the ERV is accessible right from the attic hatch when standing on a ladder. After installation, the CFM flows were verified with a balometer to ensure the system was properly balanced. After several rounds of adjustments and one diffuser restriction ring, the flows were fairly even. For more information and pricing on Dettson SmartDuct and their Chinook Compact 15,000 BTU furnace, contact Eco Achievers at 708-848-4980 or dettson@ecoachievers.com.